This comprehensive, extensively updated text covers all aspects of occupational safety and health in today’s global workplace. 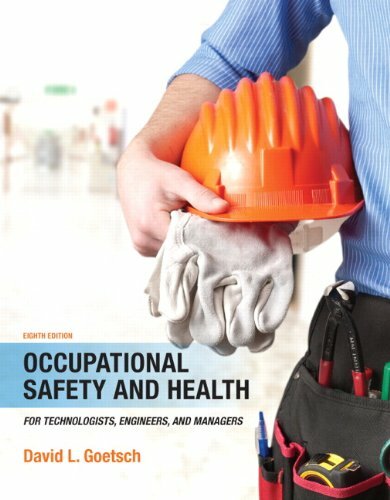 A major revision, Occupational Safety and Health for Technologists, Engineers, and Managers, 8e, presents new and revised regulations, emerging approaches and trends, updated statistics, and other new material of significant importance to students and practitioners in the field. Among the dozens of new topics covered: ROI for safety/health investments; Heinrich’s theory; Worker’s Compensation lawsuits; fall protection; hard hat ratings; PPE for cold work environments; indoor air quality investigations; fungal growth assessment; nanoscale materials; and noise reduction ratings. Clear, up-to-date, and logically sequenced, this text begins with historical perspective and overview, then covers laws and regulations; human elements; hazard assessment, prevention, and control; and key management issues. Each chapter contains case studies to promote classroom discussion; at least one safety fact or myth designed to engage students; and review questions to test mastery and promote critical thinking.